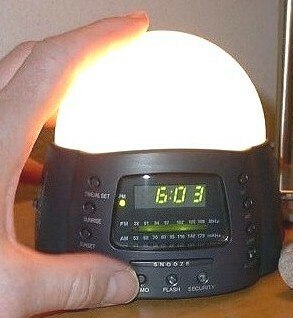 CLICK HERE to order Soleil Sunrise Alarm Clock. We are one of the largest providers in the United States for high quality relaxation and stress relief products, offering you a huge selection of stunning hand crafted indoor water fountains, tabletop fountains, indoor wall fountains, floor fountains, and outdoor fountains. We also offer sunrise alarm clocks, bean bag chairs and bean bags, comfy hammocks, Baieido Japanese incense, Nag Champa incense, custom engraved stones, zen gardens and more. Our products are of the HIGHEST quality, and help to provide you with natural relaxation, stress relief, health, healing, inspiration and feng shui. The Sun Alarm Clock combines the features of a traditional alarm clock (digital display, AM/FM radio, beeper, snooze button etc.) with an exciting new way to start your day. The special built-in light gradually increases in intensity, simulating a bright natural sunrise. Also included is a Sunset feature, where the light fades to darkness. There are several added awakening options at the end of your gradual sunrise cycle. These are the flashing light, the radio, or the beeper. Plus, you can easily pack it in your suitcase or shoulder bag when you travel, so you can enjoy the same gentle, refreshing awakenings when you are away from home. Though it is a physically small clock, it is a very unique, dynamic clock, loaded with many desirable features that enable you to gently awaken in a relaxed, refreshed state. You will really LOVE this truly amazing, very affective clock.